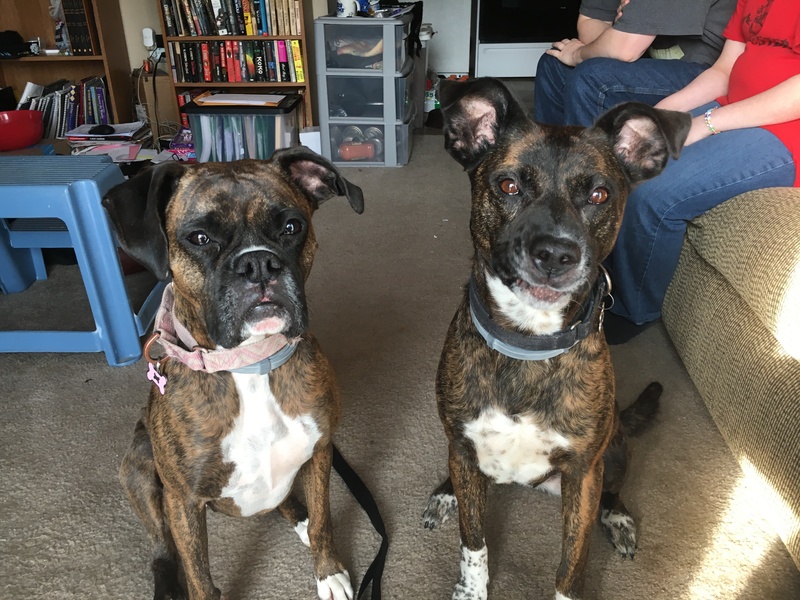 Lucy and Keely are a pair of Boxers who live in Omaha. Their guardians asked for a dog behavior training session to address Lucy’s dog aggression towards unknown dogs as Keely is starting to follow her lead. Usually dogs I work with as dog behaviorist have little self control before the session and demonstrate that when the door opens. But in this case, I was greeted by a pair of dogs who were listening and demonstrating some really good self control. That means the guardians are doing a great job at providing them direction and leadership. While the dogs displayed great control before the door opened, they did come over to meet me once I came inside. When the guardians started to repeatedly call the dogs over unsuccessfully, I suggested they stop. The more you repeat a command, the less you mean it, as far as the dog is concerned. Its a good idea to avoid calling your dog when its away from you and closer to something more interesting. That makes it more difficult for the dog to listen to you and usually results in the human repeating the command over and over. A better method would be to go to where the dog is after the first command that is not responded to. The closer you are to a dog, the more engaging you become. If necessary, the guardian can get in-between the dog and the visitor and move them away using the non verbal communication cues I shared with them later in the session. Over the course of this dog obedience and behavior session, I shared a number of dog behavior tips and training secrets with the dog’s guardians as well as different ways to communicate what they do and don’t want from the dogs. The process I outlined in the above video (including the parts taken from Karen London’s Book Feisty Fido) should only be started once the dog has completely mastered the Focus exercise and snaps its head to face the guardian any time it is uttered. This technique uses counterconditioning and desensitization to change the dog’s perception of other dogs. It takes time, patience and a lot of practice, but when done right it usually stops a dog from reacting. If it has the same result here, then it opens the door to a next step of introducing Lucy to calm, balanced dogs to build up her confidence and social skills. Avoid saying “Its ok” and petting them when the dogs are worked up to avoid making that expression itself a command to get upset. Instead touch the dog on its side and leave the hand in contact with the dog while redirecting them or moving them away from whatever they are reacting to. Practice the Focus exercise with each dog separately 2 or more times a day every day while working up to 20 seconds of focus. Stop petting the dogs when they nudge or paw for attention. Start petting the dogs with a purpose. Look for ways to delay gratification to help the dogs develop more self control. Find dog tricks that require the dog to develop self control such as balancing a treat on its nose, etc. When the dogs jump up on a human, the human should stoa dup immediately to remove the lap instead of pushing them off. Once up, give the dog a sit command and reward it for doing so. Put up construction paper on the door to block the dog’s from being triggered by the off leash dogs running past their door. Place the paper on the outside of the door or the screen if the dogs paw and rip it down from the inside glass door. Start rewarding the dog with Passive training by repeating the command word after the dog engages in a command action voluntarily. Practice the heel exercise by holding the treat on the seam of the leg as demonstrated. Make sure to only add one additional step to the heel training technique each practice session. First 1 step for 4+ repetitions. Next practice, go to 2 steps and build up to 20. Use these two training videos to stop the dog from pulling on the leash and eventually to walk in a heel. Practice the drop exercise when the dogs have low value items. Get some Bully Sticks and once they get a taste for them, try using them to redirect the dogs outside when another dog is at a sufficient distance. Add structure to meal time by having the human eat first while food remains in the bowls on the floor. Then feed the dogs based on who is calmest and one at a time.